The Art of Data Visualization, a new course offered by the Department of Applied Mathematics and Statistics, gives students first-hand experience of the power of data and the wonder of extracting information from a bunch of numbers. Targeted towards students with limited quantitative backgrounds – many who claim to have an aversion to math – this undergraduate course is about designing tools to visually communicate quantitative information. 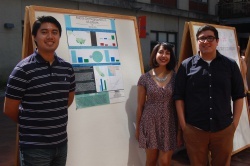 Because of UC Santa Cruz’ unique general education requirement for statistical reasoning, students have to find a way to face whatever fears, aversions or other objections they have to statistics. The Art of Data Visualization is just one example of the innovative curriculum coming out of the Applied Mathematics and Statistics (AMS) Department in the Baskin School of Engineering. Another example, Gambling and Gaming (AMS-080A), uses casino and strategy games (such as roulette, poker, tic-tac-toe and roshambo) to introduce students to basic notions of probability, statistics and decision theory. As the AMS Department expands, faculty plan to develop other statistical reasoning courses that together will comprise an “uncertainty curriculum” unique to UC Santa Cruz. Sports Analytics will emphasize sabermetrics (the statistical analysis of baseball data) and its impact on the sport of baseball. The Data that Changed the World will use a collection of famous case studies to illustrate both good and bad practices in the analysis and interpretation of data. Designed to help undergraduate students learn how to reason under uncertainty, these courses satisfy UCSC’s statistical reasoning requirement. And they attempt to transform the subject of statistics, which is sometimes considered “dull and pointless,” into one that that is lively, practical and useful.